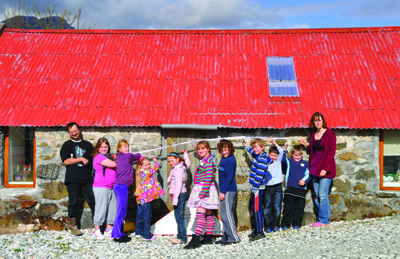 Room 13 Torrin is a community studio in Torrin, on the Isle of Skye. Membership is open to children aged between 7 and 16 who attend after school sessions led by their Artist in Residence, Becky Smith. 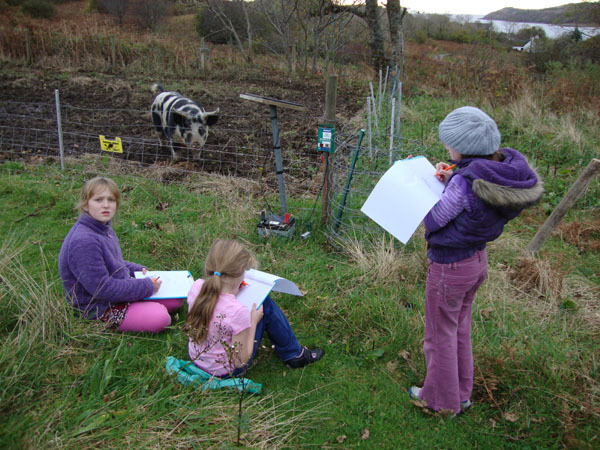 Individual artists – who come from Broadford and Elgol Primary schools as well as Portree and Plockton High Schools – are free to use the studio to work on art pieces of their own invention using professional materials in a range of media. Regular studio workshops provide opportunities for artists to explore different materials, equipment and techniques. 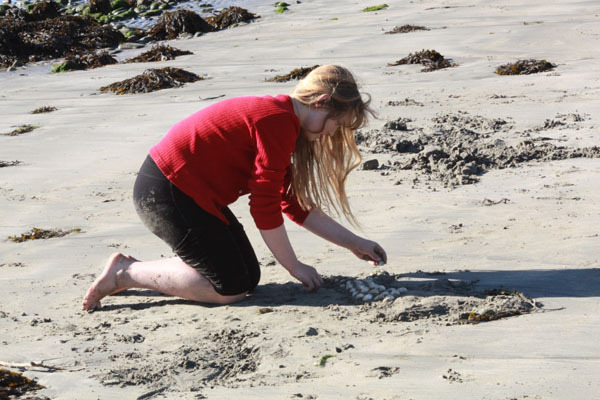 Whenever the weather is kind, artists also investigate the local beach and croft land to look for inspiration. The studio raises funds each year by selling artwork and handmade products at in-house exhibitions and local craft sales. 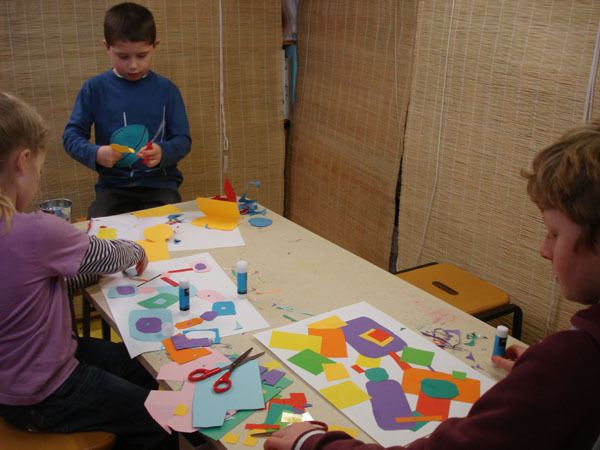 A studio like this allows children to experience ‘safe risk’ in the world of business where they enthusiastically take on the roles of chairperson, secrectary, treasurer and managing directors as well as having the freedom to be artists – doing their own work in a studio they created. Room 13 Torrin got underway in the summer of 2009 in the form of drawing, painting, printing and collage sessions in Becky’s small art shed. 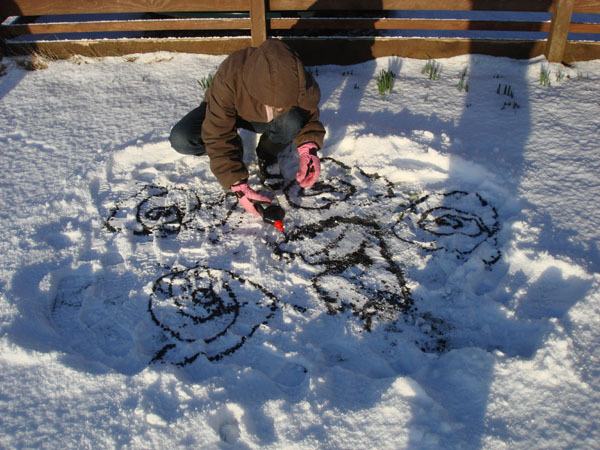 By December 2009 it was clear that more space was needed to accommodate the growing number of young artists wanting to join in the creative fun! So with the help of members of the community, renovation began on an old byre which was transformed into an art studio. After lots of hard work, the studio was ready for its grand opening in May 2010. Since then, Room 13 Torrin has established itself as a thriving community enterprise. After school sessions for primary aged children proved so popular that Becky began to run weekend and holiday workshops to allow for the exploration of other arts and craft techniques (mosaics, clay, felt making, silk painting, jewellery etc). Adult sessions began in December 2010. The studio is regularly used by ‘grown-up’ artists (residents and visitors to Torrin alike) who have just as much fun as the young artists who work in the studio. Successful fundraising projects with professionally made items such as printed bags, t-shirts, teatowels, aprons and mugs featuring a collaborative design in 2011 and a photographic art calendar in 2012 have given the management committee a taste of being entrepreneurial. Local commissions have seen artists create a dragon design for a kayak as well as some super shark stickers for a bathroom! 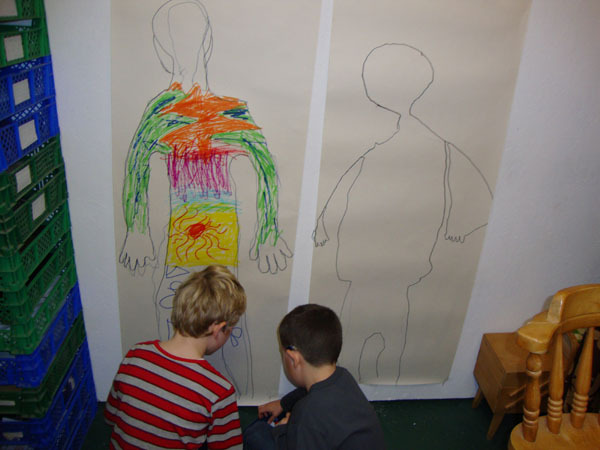 During 2012 Room 13 Torrin has also hosted a range of ‘arty projects’ for local Brownie groups and Broadford Youth Club and in October 2012 the studio held its first ‘family art day’, all led by the volunteer Artist in Residence, Becky. Room 13 Torrin extends a warm welcome to visitors from other studios around the world and enjoys visiting artists who come to run workshops and teach different skills. “In Room 13 Torrin we have done collages, drawing and painting on paper and canvases, and many, many more creative ideas, including silk painting, jewellery making, glass and ceramic painting, clay and fimo, mosaics, printing and collage, card making and stamping, and tie-dye t-shirt designing and fabric painting. We love trying out different techniques. During our exhibitions we sell canvases, drawings and paintings as well as keyrings, magnets, cards and coasters, and we spend it on things that we need like paint brushes, varnish and glue.